Kick off the New Year with Kids Club: Princess & Superhero Party! Children are invited to don their favorite princess or superhero costume during this magical event, which will be held from 11 a.m. to 1 p.m. on Saturday, Feb. 25, in Center Court. Attendees will experience live, DIY screen printing of their very own superhero and princess capes with Nashville-based Hip Hues! Enjoy complimentary face painting, balloon art, and more during this monthly family-friendly event. Admission is free. Stones River Mall requires that all children be supervised by an adult. The Center for the Arts presents “9 to 5 The Musical,” running February 10 – 26, 2017. Written by Dolly Parton, the musical revisits her 1980 classic film for this hilarious adaptation that will have audiences laughing and cheering. Like the movie, “9 to 5 The Musical” focuses on the struggle of three women in the workplace: Violet who is strong, independent and constantly overlooked, Judy – the new hire who just wants to pick up the pieces and fend for herself after the unexpected demise of her marriage, and Doralee, the straight-forward Texan that is determined to prove she is more than meets the eye. Standing in their way is Mr. Hart, the “sexist, egotistical, lying, hypocritical bigot.” Together, these women overcome the odds and learn what ingenuity, persistence, and most importantly, friendship, can do. The show is directed by Matthew Hayes Hunter. Tickets can be purchased on the Center’s website at www.boroarts.org; calling 615-904-2787; or stopping by the Center’s box office at 110 W. College St. in downtown Murfreesboro. Prices are $15 for adults; $13 for seniors, students and military, $11.00 for children. Group tickets are available. Performances are at 7:30 pm on Friday and Saturday evenings and 2:00 pm on Sunday afternoons. School’s Out for Presidents’ Day! Movie at the Mall will feature a free showing of The Secret Life Of Pets at 11 a.m. on Monday, Feb. 20, in the Food Court. Along with complimentary popcorn (while supplies last), attendees can enjoy snack specials from The Cookie Store – Stones River Mall, Joe Muggs Coffee inside Books-A-Million, and Chuck E. Cheese’s. Don’t forget to bring your own bean bag chairs and blankets! Make sure to stop by Oaklands Mansion during the Boro Art Crawl on Friday, February 10th, from 6 p.m. to 9 p.m. Featured artists include Folklore “Viva la Vida”, pottery by Roy Overcast and wood-workings by Gene Casto. The next Murfreesboro Old Time Jam will be on Thursday, February 09, from 6-8pm at Mayday Brewery. It’s open to everyone, and welcomes patrons to bring their own acoustic instrument in order to join in the fun. The focus is on Pre World War II traditional music, mainly string band, jug band and country blues. The focus is on artists like Uncle Dave Macon, the Skillet Lickers, Burnett and Rutherford, Ed Haley, and so many more. This course is designed for people who would love to pick up a knife, but are a little timid to play and have fun in the kitchen. Our 3 week program will introduce you to the world of classic and international cuisines,from the ground up. You will learn knife skills, cooking techniques, soup & salad preparations, vegetables, starches, use of fresh herbs, chicken, seafood,and beef. We will also cover basic desserts, pastries, and garnishes/plate presentations in each class. The Beginners Series will give you a solid foundation of cooking basics and you will feel more at ease cooking and entertaining in your own home. If you can’t attend a class, please let us know at least 3 days in advance and you can make-up that class with any of our other classes, or in the next Beginner’s Series. Bring your little ones to enjoy a Storytime and Puppet Show at 10 a.m. on the first Friday of every month! Join Linebaugh Public Library System inside Books-A-Million for a fun, family-friendly, and educational event! 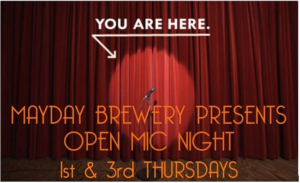 Mayday Brewery invites local musicians to come show off their talent in the Mayday Tasting Room on the 1st and 3rd Thursday evening of every month at 6:00 beginning September 1, 2016. Admission is free and the event will be open to any musician wanting to play. Each musician will have the opportunity to play for 10-12 minutes, two to three songs. The event is being organized by local musician Ashlie Jewel. “Murfreesboro needs a place where local aspiring musicians can express their talent in a supportive, relaxed environment. Mayday is the perfect place because everyone here is family”, Jewel explains. 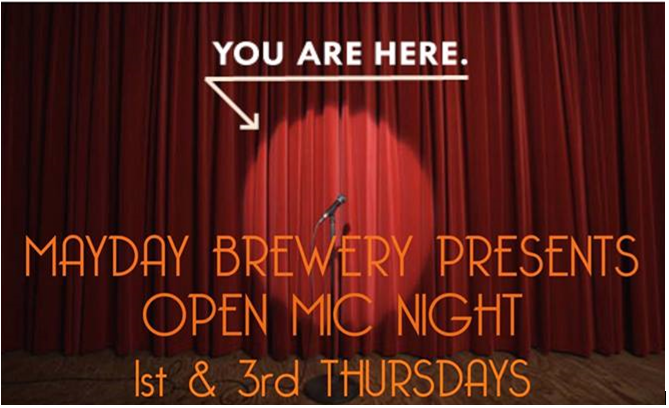 In addition to the new open mic event, Mayday has a tradition of unveiling a new small batch beer every Thursday. Also, My Roots Curbside Culinary food truck will be onsite every Thursday selling their delicious freshly prepared food for the music lovers. When: 6:00 – 8:00 p.m. the 1st and 3rd Thursdays of each month beginning September 1st. Mayday Brewery produces six core craft beers and can be found on-tap at more than 130 Middle Tennessee restaurants and bars. The tasting room is open to the public from 4-8 p.m. on Wednesday through Friday, 1:00-8:00 p.m. on Saturday, and 1:00-7:00p.m. Sunday. Brewery tours are also available Saturday at 3,4 &5pm. Brewery visitors may purchase pints or half-gallon jugs of beer at the tasting room, and patrons are encouraged to bring a picnic or purchase from one of several food trucks that regularly visits Mayday. Full Force Diesel SEBRA Exteme Bull Riding National Finals, presented by Parker Brothers Window Tinting comes to Murfreesboro for two nights of edge of your seat action! Come watch the top Cowboys & Cowgirls of the SEBRA Association compete for year end championships! Both nights include Bull Riding, Bronc Riding, & Cowgirls Barrel Racing along with lots of laughter from the world renowned rodeo clown barrel man, Brett Carpenter & the amazing Roman Riding & Trick Riding team Justin & Dusti Dickerson! Are you frustrated or even stalled in your job search? Career Coach, Fred Frazier, will discuss overcoming obstacles to assist you in finding gainful employment.